So far I’ve been unconvinced by Marvel’s Fear Itself event. The comics – including this one – tell us that the whole world is wetting themselves, without showing us why this crisis is so much worse than any other. Surely the populace of Earth 616 are battle hardened by now? I just haven’t understood the fear. Now I do. 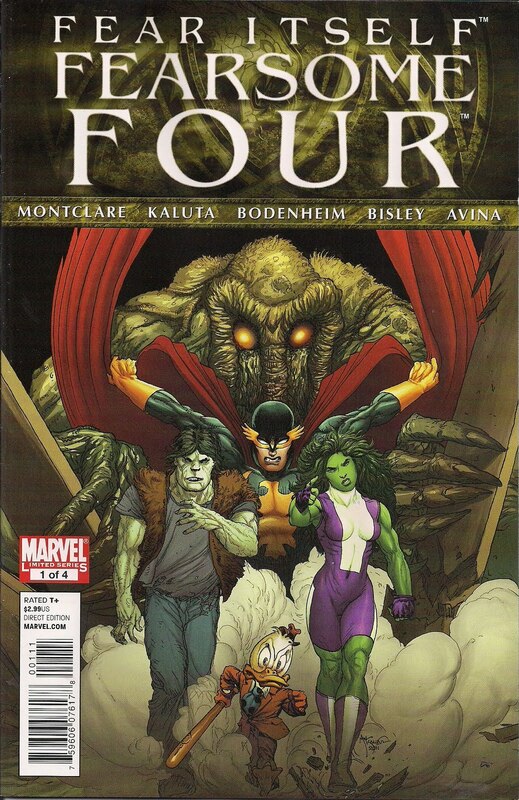 Fearsome Four #1 has me terrified. Terrified that one day I’ll re-read this dire effort. The idea isn’t that bad. If we take it on trust that everyone, everywhere, is terrified, of course it’s going to affect Man-Thing, the swamp monster attracted to fear. So there will be a lot of people burning at his touch. 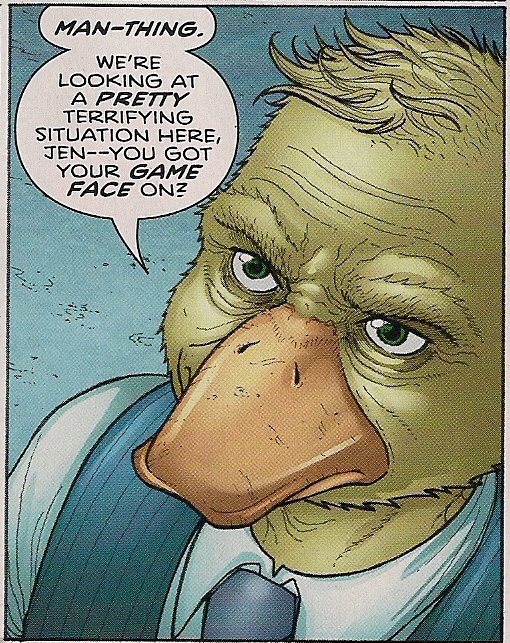 It even makes a little sense that Howard the Duck would try to rein his friend in for his own good, before powerful heroes take him down permanently. It’s the execution that’s the problem. Howard looks like no Howard I’ve ever seen, he’s a Chicken Licken-alike who looks even worse than the movie version. He doesn’t sound like Howard, coming across as a generic streetwise guy. And he sure doesn’t act like Howard, having none of the humorous cynicism his creator, the late Steve Gerber, gifted to him. If you told me this was just a kid in a bad duck suit I’d believe it. Then there’s She-Hulk, called in by Howard to help. She has no personality, displays no initiative. Yes, Jen Walters can do the serious hero, but if she’s not delightful, she’s not the Sensational She-Hulk. And this big green woman is simply woeful. The Frankenstein Monster is the meekest, least scary sewn-together creature you ever did see. Worst of all is Nighthawk, who acts like a bargain basement Rorschach, complete with melodramatic commentary (click to enlarge). I did consider making a case for this comic as some kind of postmodern satire, but couldn’t see it commentating on anything. Rather, it hints at a Marvel desire to flood the market with event tie-ins. Former DC editor Brandon Montclare demonstrates that you don’t have to be a great writer to be a good editor. As well as the characters being off, there’s no sense of tension – we’re told the entire world is running scared, then introduced to a young couple so horribly afraid that they’ve plonked themselves down on a park bench to canoodle. There is some attempt to get with the fear theme, but this boils down to the boy trying to convince the girl not to be afraid of his sweet lips. 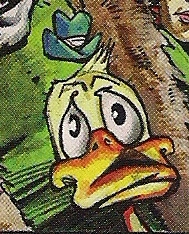 Drawing most of the book is Ryan Bodenheim, and I assumed he’d been given some edict from on high that Howard the Duck must not look like Donald Duck, child of Marvel owner Disney. But along comes Simon Bisley for the last few pages, and suddenly Howard is here, looking like himself. The real deal is on Mike Kaluta’s enticing cover, too. So why the chicken guy? Surely it’s not that tough to remember that Howard’s beak dominates the bottom of his head? I believe Marvel may even have some helpful visual reference. The rest of the cast don’t look half bad under Bodenheim, and Kaluta’s few interior pages are decent too, but the two artists just don’t sit well, side by side. The final, Bisley, pages are gorgeous, and an even more jarring change in approach, but here it works, as madness hits the characters. There are three more issues of this. Anyone who bought this first issue will pass, no fear. I did see this one on the shelves. Thought about for the sake of Howard, but after reading this I'm very glad I gave it a miss. I also have to say that I totally agree with you on the 'Fear' element of Fear Itself. Or indeed the lack of coherent evidence to support it. Right now Marvel seem to be trying to feed the reader the concept is that the whole world is in chaos because of what is going on, and effectively that is why everybody is so afraid. 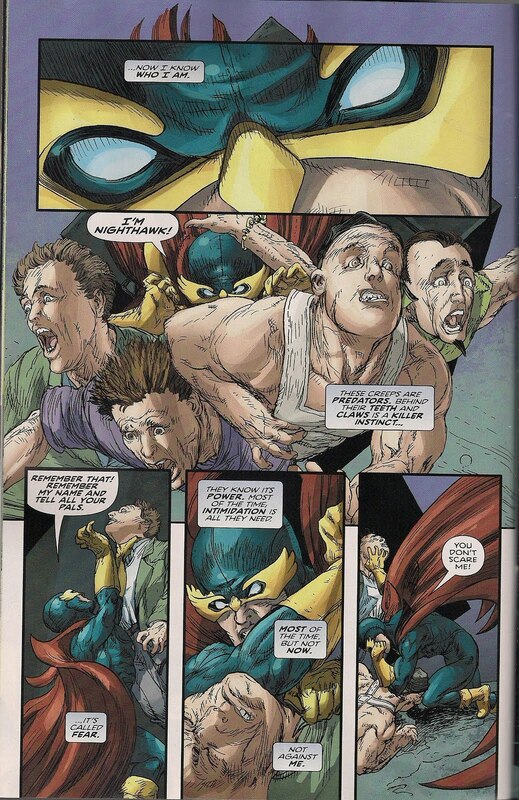 Remember House of M – which truly WAS a fully worldwide Event? We had Magneto based out of Genosha, The Hulk in Australia, Doom's version of the Fantastic Four in Latveria, The Black Panther in Wakanda, Storm ruling Kenya and Captain Britain ruling… well Britain. There was a clear Global Picture painted. Yes, we've had Hulk in Brazil and I understand Iron Man has been to Paris, but in terms of showcasing the level of Global Threat – especially through the main series – these locations have been very little more than footnotes at best. The entire of the rest of the story has been played out in little more than two cities in North America. I think it's such an incredible waste of such a solid concept. Those Hammers should have been falling all over the Globe, a proper spread. Because if this other Odin intends to smite all life on Earth, or take it over, (or whatever his long term plan actually turns out to be)he's not actually going to get very far if all that he effectively achieves is the taking over of New York and Washington. So far Fear itself hasn't worked because a) there is no explicit link shown between a bunch of guys running around with super hammers and the all-consuming fear people are showing. Sure, there's some type of mystical fear-spreading go on, but no one has bothered to actually show or explain this. Mark, you did well to avoid, it'd just annoy you. I keep wondering if the Fear element is being portrayed well in some book I've not been reading. Apparently not. I got the impression the world is meant to be scared not simply cos of Snakey Jakey the Fear God, but of the Recession, wars, comic geeks … it's not convincing, is it? I wish Marvel would stop trying so hard to make their world so close to ours, as it simply can't work. I hope D don't go the same route with their upcoming changes. I agree re: Scandinavia. Heck had Thor even been there since he found the cane? Snell, I'm actually finding it hard to even open these books up, when I bother to buy them. I just find the story so (to quote Lucy Van Pelt) blah.